Post number 3 in this little series is here! To catch up with my guide's to presents £5 and under and £10 and under just click HERE or HERE! I love love love shopping for other people and I love going overboard at Christmas! These gifts range from just £12 to £20 .... yes they are mostly beauty bits but I know most of you normal readers love that kind of thing! Last year was the first time I had tried out products from Joules and I was so impressed! The quality is amazing and the scent was right up my street! This pack contains a huge pot of both body scrub and body butter - this is perfect for the ladies in your life... I know my Mum would love it! S&G are always a favourite... espically with bloggers... and this year they've stepped it up with their make-up gifts and have relased a gorgeous eyeshadow palette! 10 great shades for a fantastic smokey eye - sometimes you don't have to pay a fortune for palettes! The Benefit balms caught my eye as soon as they were announced earlier this year and this gift set is the perfect chance to give someone a proper treat! You get 2 of the lip balms which are about £14 on their own usually so this itself is a total bargain plus you get 2 mini tints aswell - a total steal! Sooooo tempted to buy this for myself! I swear I always end up buying at least one person a mug for Christmas - most people drink some form of hot drinks right? So they are always going to come in handy! This Starbucks Cocoa Duo set is a yummy hot chocolate gift with 2 lovely mugs and some chocolaty goodies, perfect for anyone who's not a coffee fan too! Know someone who's never tried Smashbox and their amazingness? I love this brand, although working a boring 5 day a week standard job I can't really afford to kit my make-up bag out head to toe with it *sad face*! This is a gorgeous gift of 5 mini products to try out, any make-up lover in your life would be super impressed with this! More? ... oh okay then! 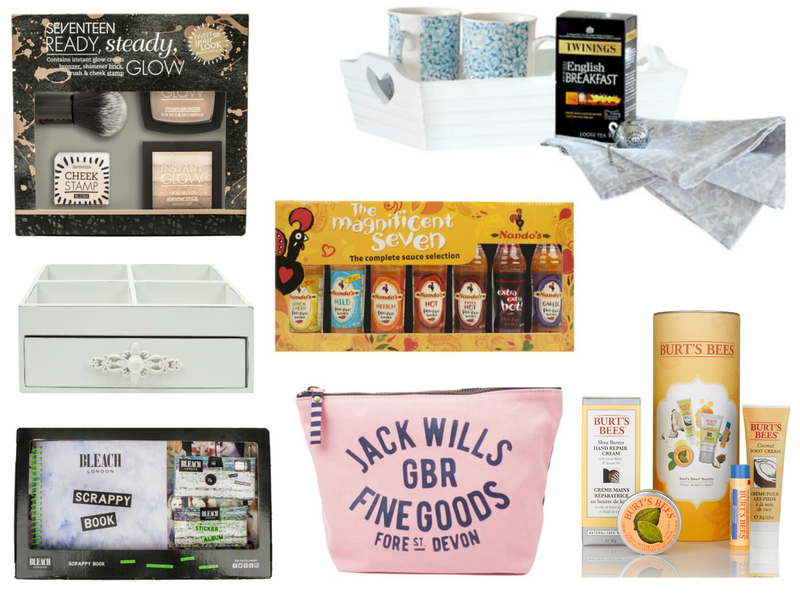 Here's some more gifts for £20 or less! Seventeen have some amazing products in their collection at the moment and this gift set contains at least 2 of them! I use the shimmer brick all the time and I've also tried the cream bronzer which is fabulous! So if you're looking for a decent present with a tiny price tag this is he one to go for! Tea, tea, tea - who doesn't love a nice cup of tea? This set is a lovely home gift for any lady in your life! Jack Wills is a new brand to Boots this winter and their stuff has been flying off the shelves! Their range fits in perfectly with the other collections Boots has to offer and I love their classic blue and pink scheme! This is a great size for holidays, trips away and even as an everyday make-up bag! This set contains products for your feet, hands, nails and lips! A lovely looking set - perfect for Mum's & Aunties! I love nosing at their Christmas sets once they come in, but always nearly end up buying a coffee one for myself! The Twinings gift set is so unique. Id love that benefit set! 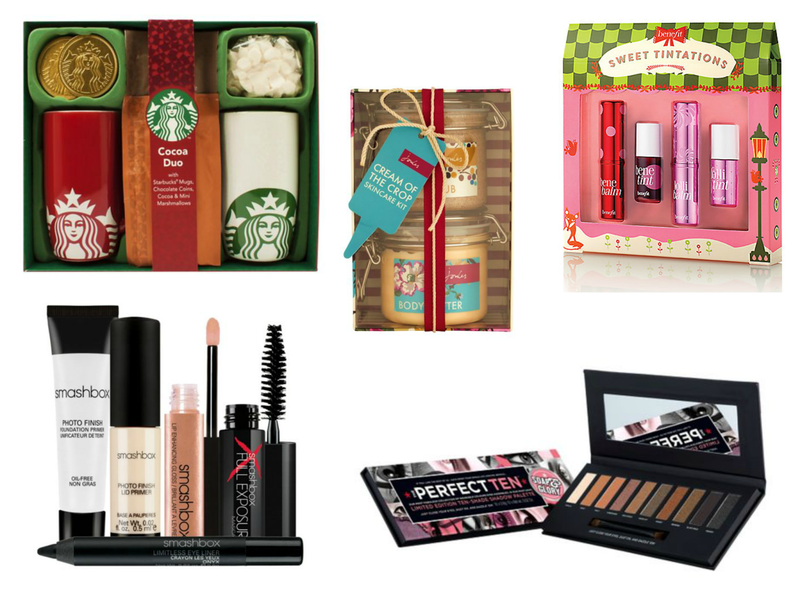 i really love the benefit gift sets this year!